* Colleen (bottom row, second from left). 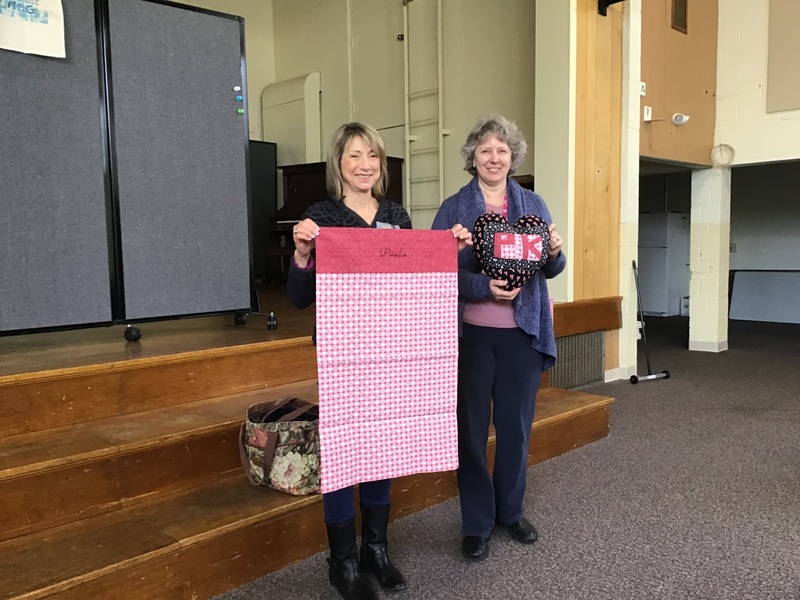 All of the participants will have their quilts displayed this month at the East Kingston, N.H. Public Library. Congratulations to all. For those who are still working on theirs, we are looking forward to seeing the finished product! After voting on the improv quilts and holding the rest of our brief business meeting, we got down to work on our Sew Together Bags. Jane brought a bag (above) that she completed a while ago. Her hope was to inspire us as we completed our own bags. The top was pieced by Nancy and the quilting was done by Patty. The back says “Blessings” on the printed fabric. All those who made blocks signed the label square. Sue showed some Hawaiian-themed needle turn appliqué that she made for her daughter. 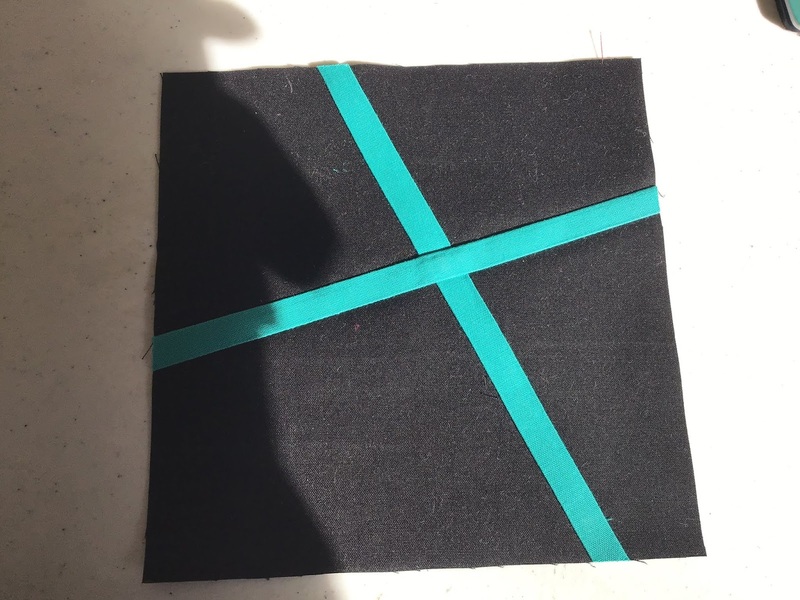 The process includes layering two pieces of fabric, tracing the pattern onto the yellow fabric, then turning under the edges. 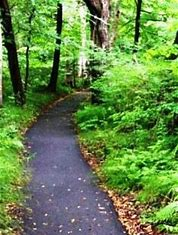 For those who are going on retreat, we will see you in early May in Kennebunk. 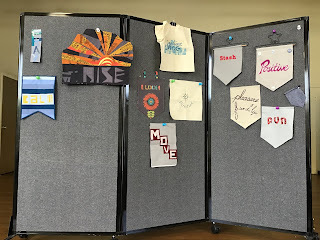 Our regular May meeting is May 18.
this month as we looked at works from Quilt Con 2019. Above and below are quilts by Sherri Lynn Wood. Some quilts, such as "It's My Birthday!" (above) by Evie Jesperson of Durham, North Carolina riffed on well-known designs while others (below) by Maria Shell of Anchorage evoked a specific time and place (in this case, mud season in Alaska). 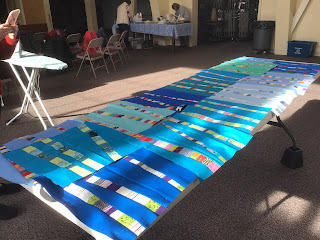 Other quilts asked viewers to reflect on current events, such as transgender rights or the separation of children from their parents at the border. Every state but Rhode Island was represented at the conference in Nashville, Tennessee. 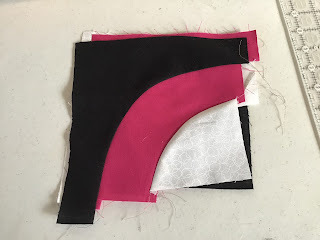 Besides the slide show about Quilt Con, we discussed the Sew Together Bag, which we'll be putting together at our April meeting (and possibly the May meeting as well). Here is a link to the pattern. We suggest coming to the April meeting with your pattern pieces cut out and interfaced. For those wondering which type of interfacing to get, we recommend Pellon SF101. Other useful tools include Wash Away Wonder Tape by Dritz (for zipper installation) and Clover Wonder Clips. ByAnnie's Soft and Stable is a good, thick interlining fabric. The April meeting will be held at the Brentwood Public Library in Brentwood, N.H. In other business, many people participated in the "Love Notes" block lottery. Directions were distributed for a voluntary "Round Robin" project. As shown in Sue's quilt below, this type of project involves making a quilt with partners. All of the group members have a hand in designing and sewing the quilts. * The May meeting will be held in West Newbury, Mass. on May 18. * A trip to Alewives Fabric in Nobleboro, Maine is in the works, most likely for Saturday, June 8. 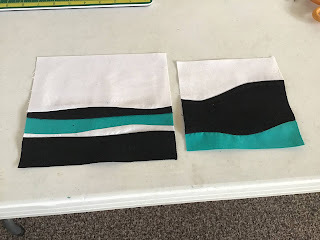 * The Modern Quilt Guild is hosting a Riley Blake Challenge. Details are here. We had a full slate of show-and-tell participants this month. The "Bright Birch Trees" blocks that we sewed for a member's daughter who experienced a fire have been transformed into a quilt top. Rachel showed us a quilt top she made from a Michelle Collins "Boho Mod" pattern. Everyone oohed and aahed at the colors. Marylee's "Word of the Year" banner features a clever use of a candle and feather. Lou brought a small quilt she made as part of a "Paint Chip" challenge. Kate displayed an extra large quilt she designed and sewed for her mother's guest bedroom. The back is a large-scale floral, and Kate discovered that she loves working with this fabric. Barbara shared that she intends to make a bag out of cork and vinyl that she bought at Quilt Con. Because of her choice of materials, she won't need to line the bag. 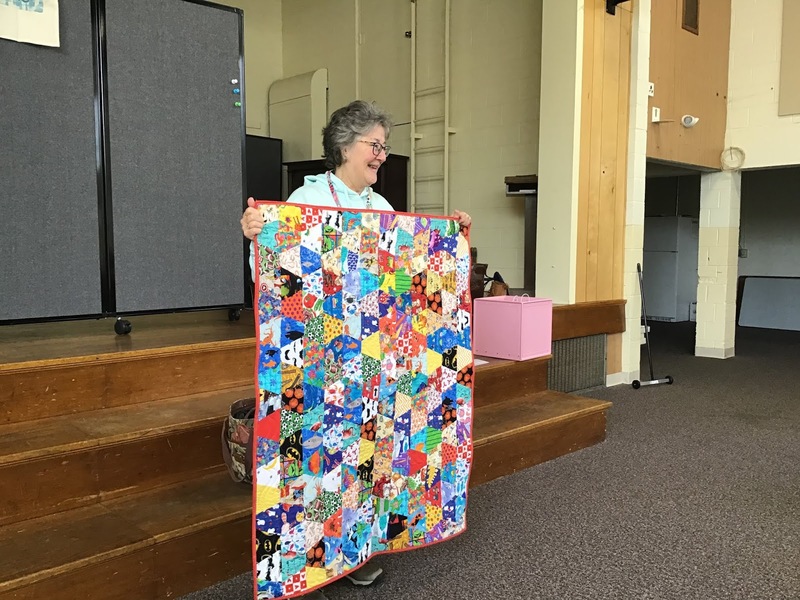 Diane had several pieces, including an "X" block quilt that she made as part of a "Mighty Lucky" quilting club. Another piece used blocks she made during a shibori dyeing workshop at the New England Quilt Museum in Lowell. Linens, polyesters, and upholstery fabrics are included in the quilt. A third quilt is a variation on the Log Cabin block. It looks like a pieced quilt but it's actually a single piece of fabric. The quilt's inspiration was a wonky lottery block Diane made. Mary showed a log cabin wall hanging that includes applique. She used a "super easy" way of hanging the quilt (hint: it uses a ruler). Due to the snow storm that is predicted for Saturday, March 2, our meeting has been postponed until Saturday, March 9. Join us from 10 a.m. to noon at the public library in Kingston, N.H.
Couldn't make it to Quilt Con this year? Members who attended the four-day modern quilting extravaganza in Nashville will share highlights at our March meeting, which will be held at 10 a.m. Saturday, March 2 at the public library in Kingston, N.H. 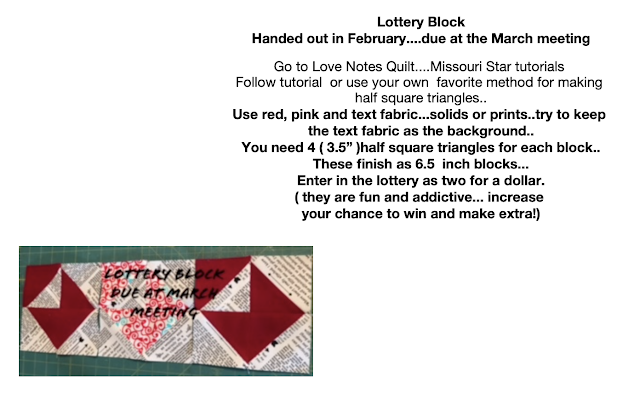 The Love Notes Lottery Blocks are also due and we have seen some cute ones. 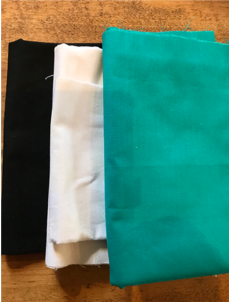 Also in March we will do a demo on the first steps that will need to be done over the month in preparation for making the Sew Together Bag in April. We will likely need 4 teachers, so please contact Diane or one of the officers if you can assist. If you would like to make the bag, please purchase the pattern (here) and cut out and interface all pattern pieces before the April meeting. 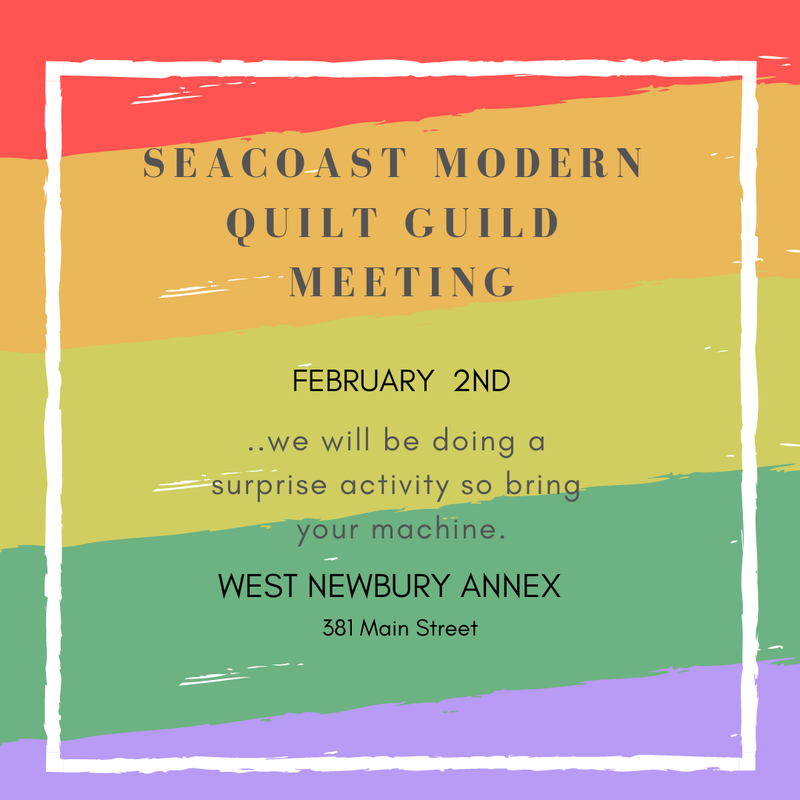 All participants are invited to turn their timed improv blocks from the February meeting into an 18-inch quilt to be displayed at the East Kingston, N.H. library. Bring your quilt to the April meeting if you would like to participate. We are planning a day trip to Alewives Fabrics in Nobleboro, Maine in June. Come for the quilts.....stay for the friendships. Looking forward to seeing everyone March 2! Whittle down our stashes, keep moving, stay positive, and have fun. Those are a few of our intentions for 2019. 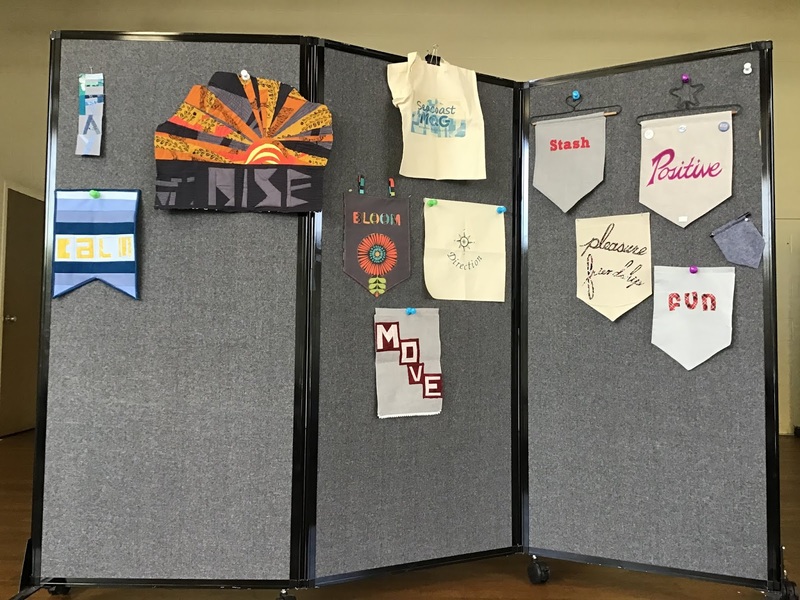 After choosing our "Word for the Year" at the January meeting, members showed them off in fabric form at our February meeting. A particularly important intention for our guild is to keep learning. Fortunately, a couple upcoming webinars from the Modern Quilt Guild can help: on February 7 at 8 p.m. EST, Tim Eads will discuss textile surface design, and on March 14 at 9 p.m. EST Cheryl Arkison will give strategies for conquering the fear of improv. Members can register for both presentations on the Modern Quilt Guild website. All webinars are archived, so you do not have to view the original presentation to take advantage of the information. We encourage members to turn one or more of these blocks into an 18-inch quilt to be displayed at the East Kingston, N.H. library. Bring your quilt to the April meeting if you would like to participate. The meeting included a short but enthusiastic Show-and-Tell session. Jane shared several project bags that help keep her projects organized. The pattern is Bridget's Bagettes by Atkinson Design. I bet that Marie Kondo would love Jane's bags. Suzanne shared a tumbler quilt that she intends to donate to Project Linus. She hopes to make other blankets for this organization and, in the process, sew down her stash. Several members brought in "Bright Birch Trees" blocks for the daughter of a member whose home suffered a fire. * A warm welcome to our new members- Rachel joins us from Haverhill and Hayley joins us form Berwick, Maine. Hayley has her own textile business and is happy to share her skills with us. 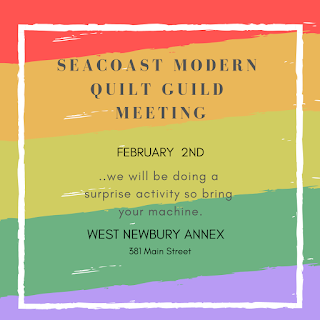 * Our March meeting will be held at the public library in Kingston, N.H., where we will share highlights from Quilt Con. 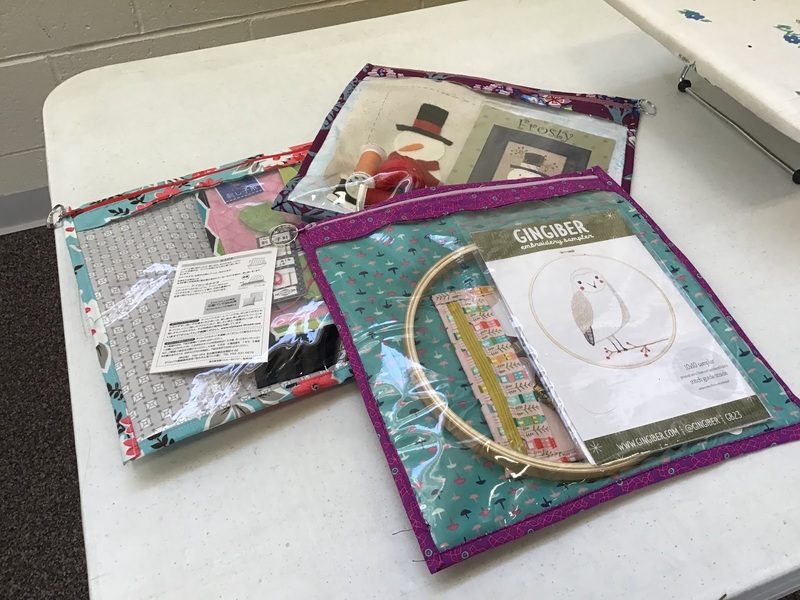 * Our April meeting will be held at the Brentwood, N.H. library and will include a workshop on the Sew Together Bag. If you would like to participate, please purchase the pattern (here) and cut out and interface all pattern pieces before the meeting. * Retreat is approaching (May 2-5). If you are joining us, it is time to make your first payment. A fee schedule was included on an earlier blog post. * We're also planning a day trip to Alewives Fabrics in Nobleboro, Maine in the spring. * If you show your quilts on Instagram, remember to tag us (#SMQG or #seacoastmodernquiltguild).